FamilyFarmed‘s Good Food Financing & Innovation Conference, coming up on Thursday, is Chicago’s must-attend event of the year for investors, retailers, wholesalers, distributors and others who want a heads up about the region’s most promising Good Food businesses and products. And the centerpieces of this world-class networking event are the business pitch event and the Financing Fair, described below. The Conference’s annual business pitch session on Thursday (11:30 a.m- 12:30 p.m.) has a hip new name: Pitch It! Good Food Takes the Floor. The owners of some of the region’s most promising young businesses will present their plans to prospective investors and stakeholders who can help them grow. And — even more exciting — for the first time, all of those pitching this year are Fellows in FamilyFarmed’s Good Food Business Accelerator (GFBA). GFBA was launched in 2014 after investors informed FamilyFarmed that many of the businesses they met at the Financing & Innovation Conference had great potential, but needed more polish. Now in its third cohort of nine competitively selected businesses, GFBA provides an intensive six-month curriculum, technical assistance, networking opportunities and (of course) access to the growing community of Good Food investors. All 18 Accelerator graduates report business growth and other positive impact from participating in the program. And, in keeping with FamilyFarmed’s dedication to diversity, nearly half of the Fellow businesses have been woman-owned and/or minority-owned. • Maya-Camille Broussard, Justice of the Pies, Chicago: Maya established Justice of the Pies in 2014 in honor of her late father, a criminal defense attorney with a passion for baking and eating anything made with a crust! Justice of the Pies is committed to delivering amazing pies, quiches and tarts while positively benefitting the lives of those who work for the company. • Jordan Buckner, Skyline Kitchen Inc., Chicago (producer of Tea Squares): TeaSquares, Skyline Kitchen’s premier product, is a snack with a purpose to give people the fuel to achieve their passions, and a social mission to fuel economic development in urban centers. TeaSquares are infused with naturally occurring caffeine from organic tea grown without the use of artificial ingredients or preservatives. (To read more about Tea Squares/Skyline Kitchen and its owners’ social mission, please click here. • Beth Denton, Fruitbelt, Sawyer, Michigan : In 2012, Michele and Beth began a quest for a refreshing and healthy alternative to sugary soda. Four years later, Fruitbelt became the world’s first sparkling fruit tonic: festive, unabashedly tart, blending juice from pressed apples and other varietals with honey and proprietary bitters, allowing the taste of unvarnished fruit to come alive. • Colin Tomkins-Bergh, Simply Native, River Falls, Wisconsin: Simply Native exclusively uses plants indigenous to North America to make Ancient Foods for Modern Times™. All of their products are non-GMO, gluten-free, vegan, quick-cooking and versatile. They are working to build a team that allows them to grow the business and give back to indigenous cultures in North America. • Alison Velazquez, Skinny Souping, Chicago: Skinny Souping is a soup company featuring preservative-free, healthy sippable soups. Wellness expert and author Alison Velazquez, started Skinny Souping in 2014 with a mission to create high-quality, innovative, healthy products which enable people to conveniently eat healthy on the go. We will also be hearing updates from GFBA alumni on how they have grown their businesses since participating in the Accelerator and what they are planning now. 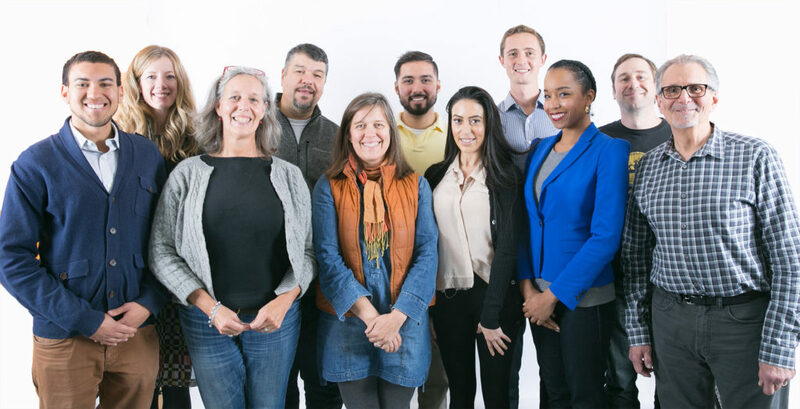 All nine businesses participating as Fellows in the current cohort of FamilyFarmed’s Good Food Business Accelerator will participate in the Good Food Financing & Innovation Conference’s Financing Fair on March 16, and several will participate in the business pitch event. From left, Jordan Buckner of Tea Squares/Skyline Kitchen, Megan Klein of Here, Michele Gazzolo of Fruitbelt, Daniel Sikorski of The Eating Well, Beth Denton of Fruitbelt, Isaac Lozano of Tea Squares/Skyline Kitchen, Alison Velazquez of Skinny Souping, Colin Tomkins-Bergh of Simply Native, Maya Camille-Broussard of Justice of the Pies, Art Jackson of Pleasant House Pub/Royal Pies, and Mitch Wasserman of Full Belly Foods. 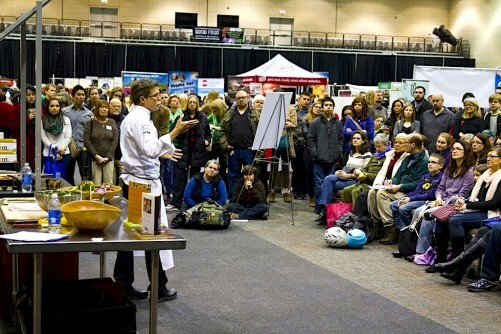 The afternoon continues with the Good Food Financing Fair (12:45–2:30 p.m.), a dynamic environment where innovative farms and food businesses seeking capital can engage with funders, pitch their business plans and forge new partnerships! More than $30 million in business investments have been raised by past participants in the Good Food Financing Fair and the Good Food Business Accelerator. This year, 24 businesses — including all nine current Good Food Business Accelerator Fellows and four Accelerator alumni — will participate in the Financing Fair. They will be joined by nine leading lenders, funders and partners in the Good Food space. • Full Belly Foods, Inc.: produces a unique line of all-natural artisan pickles and pickled vegetables. • Here: makes dips, juices, and other value-added products using Midwestern produce to support regional farmers and producers. • The Eating Well: An employee-owned business that makes paleo, vegan and gluten-free meals and snacks, including four varieties of gluten-free, vegan vegetable burgers. Also participating in the Financing Fair are the five GFBA fellows participating in the Pitch It! event and described above: Tea Squares/Skyline Kitchen, Justice of the Pies, Fruitbelt, Simply Native and Skinny Souping. • Phoenix Bean Tofu (GFBA 2014-15): uses only the finest Illinois grown non-GMO soybeans with no additives or preservatives to create the most flavorful tofu in small batches. • Spark of the Heart (GFBA 2014-15): a socially responsible business that produces all-natural, vegan and gluten-free dried soups, salads, and sides; co-packaged with pride by the developmentally challenged. • The Cider Farm, Mineral Point, Wisconsin (GFBA 2015-16): an organic, estate orchard producing small-batch, handcrafted brandy and cider made from true cider apples. • Around the Bend Beer Co.: an innovative craft brewery experimenting with flavors, styles, and techniques to create high-quality ales and lagers. • Broad Shoulders BBQ: a company with a dual mission to bring people together with their premium all-natural BBQ sauce and strengthen communities by partnering with local non-profits. • Mindful Indulgences: creators of conscientiously crafted and curated organic, vegan, fair trade chocolate confections, as well as seasonal gluten-free and soy-free baked confections. • Nana Organic: a family-owned restaurant promoting organic, local and sustainable meals. • Nutritional Decadence: produces Cocolasses®, a nutrient-dense, fermented syrup made of dark chocolate and blackstrap molasses that is free from gluten, dairy, HFCS, processed sugar and artificial ingredients. • Poppilu: an all-natural, lower-sugar lemonade bursting with citrus and boosted by antioxidants from Iowa-grown aronia berries. • Sacred Serve: a Conscious Creamery that manufactures organic, raw, vegan gelato out of The Plant Chicago, a Good Food business incubator. • Spice Foods : a snack food company pairing ingredients such as almonds, popcorn and rice crackers with spices from all over the world, with a mission to tell the stories of exotic global cultures through taste. • The Kombucha Room: a retail concept featuring a 20-line taproom serving kombucha that is crafted by Chicago local or Midwest regional artisanal brewers. 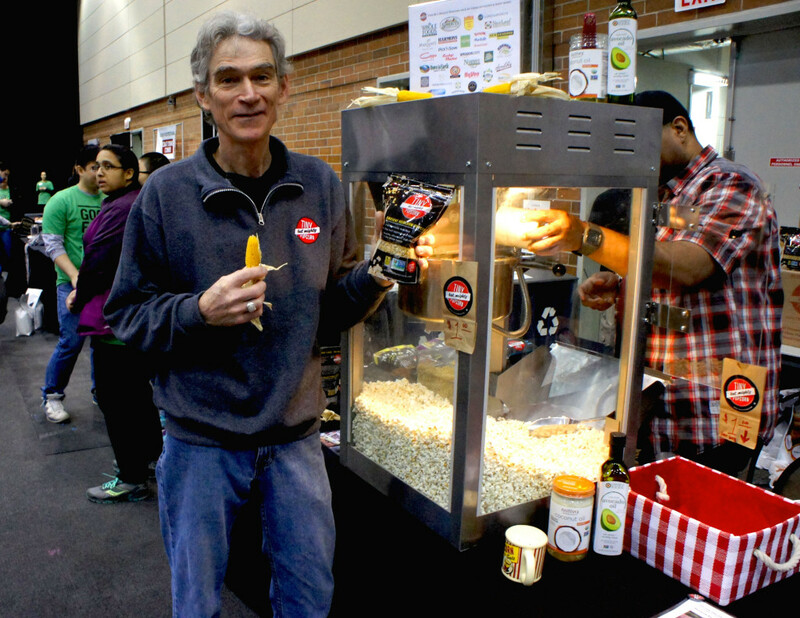 • Tiny But Mighty Foods, Shellsburg, Iowa: A vertically integrated popcorn company with proprietary heirloom kernels that produces non-GMO, tiny, hull-less popcorn packed with flavor. • AccionChicago: a nonprofit that helps communities grow by investing in people who build businesses and generate jobs in their neighborhoods. Accion provides customized capital solutions and one-on-one coaching to underserved entrepreneurs in Illinois and Northwest Indiana. • Colonial Funding LLC: a diversified investment company that bring pools of performing and non-performing assets to market and offers unique purchasing programs for owner-financed real estate notes, loan portfolios and structured settlement annuities. • 1st Farm Credit Services, Normal, Illinois: the largest agricultural lender in Illinois, serving farmers and those who invest in rural America with all of their agricultural credit and financial needs. 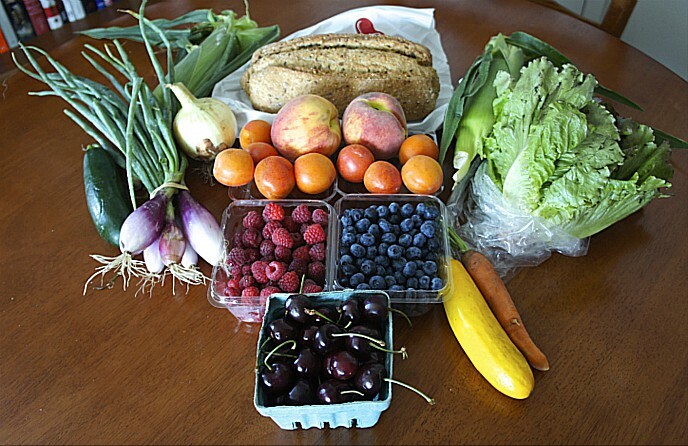 • Iroquois Valley Farms, Evanston, Illinois: an impact investment firm that invests in local and organic agriculture following triple bottom line principles — social responsibility, environmental soundness, and economic viability. • Self-Help Ventures Chicago Office: a financial services provider lending to small businesses and nonprofits, developing real estate and promoting fair financial practices, with a focus on those underserved by conventional lenders. 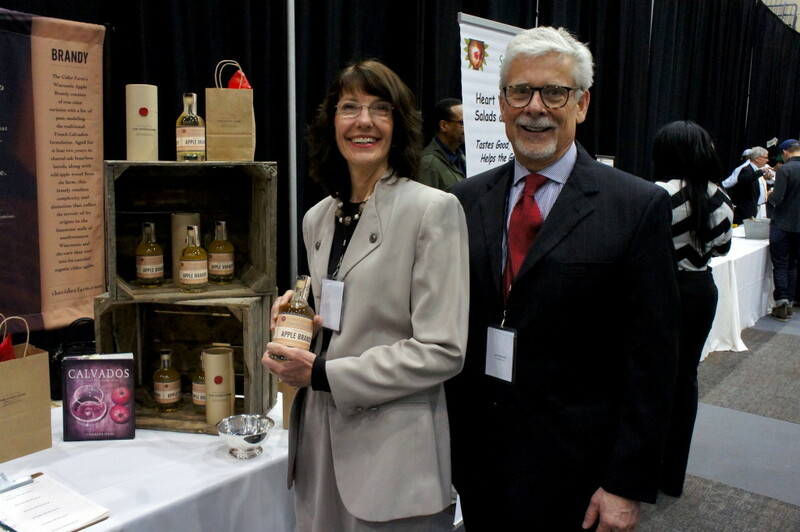 • SLoFIG: a network of angel investors who share the mission of using private investment to re-establish a robust, sustainable local food system across Chicago while realizing a profitable return. • Small Business Administration Illinois District: an independent federal agency assisting and protecting the interests of American small businesses. SBA’s Illinois District Office and its Springfield branch office are responsible for delivering SBA’s many programs and services throughout Illinois’s 102 counties. • Spiral Sun Ventures: a mission-based seed capital fund that promotes a healthier lifestyle by investing in companies that create better-for-you consumer products. At the end of the day — stick around! The day-long Good Food Financing & Innovation Conference is capped by a Networking Reception where you will enjoy local food and craft beverages while engaging with funders, investors, entrepreneurs and other attendees. Check out the food and drink providers and the rest of the Conference schedule by clicking here. And visit the Good Food Festival & Conference site for full information on our annual three-day event that kicks off Thursday. This entry was posted in Family Farms, Financing, Food Entrepreneurs, Good Food and economic development, Good Food Business Accelerator, Good Food business development, Good Food Festivals, Good Food Financing Fair, Good Food marketing, Sustainable conferences, Sustainable food business investment and tagged 'Laine's Bake Shop, 1st Farm Credit Services, Accion Chicago, Around the Bend Beer, Bluestein Associates, Broad Shoulders BBQ, Colonial Funding LLC, FamilyFarmed, Fruitbelt, Full Belly Foods, Good Food Business Accelerator, Good Food business development, Good Food Business Investment, Good Food Financing &Innovation Conference, Good Food Financing Fair, Here, Iroquois Valley Farms, Justice of the Pies, Mindful Indulgences, Nana Organic, Nutritional Decadence, Phoenix Bean tofu, Pleasant House Pub, Poppilu, Royal Pies, Sacred Serve, Self-Help Ventures, Simply Native, Skinny Souping, Skyline Kitchen, SLoFIG, Spark of the Heart, Spice Foods, Spiral Sun Ventures, Tea Squares, The Cider Farm, The Eating Well, The Hatchery, The Kombucha Room Chicago, the zen of slow cooking, Tiny But Mighty Foods, U.S. Small Business Administration. Bookmark the permalink.